The size of the werewolf is directly related to how tall they are in human form. While they range from the size of a large dog to a normal wolf, most are much larger. Werewolves as a pack animal as much as normal wolves are, disliking to be alone or separated from their companions. In wolf form, the werewolf retains the ability he or she had as a human, though they as usually enhanced. A bitten werewolf will experience its first transformation instantly or by the first full moon directly after. Species info credited to Skyeh and Blazeh/Verridith. 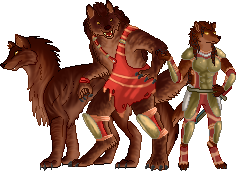 Appearance wolf form: The werewolves of Felnova are large quadrupeds, their size depending on how tall they are in human form. While werewolves may range from the size of a large dog to a normal wolf, most are much larger, from slightly bigger than a traditional wolf to the size of a small horse. They generally have much larger jaws, paws, and teeth than their Vystrian counterparts, and are more muscular, densely built. Their pelts can range to be any color, with one limitation; not including markings on the fur itself, its base color is that of the wolf's human form. Eye color likewise. Generally speaking, werewolves will be bigger than your average wolf. Sometimes they may decorate their wolven form with a necklace or earring, something that doesn't change in the shift. human form: Werewolves in human form do not usually change appearance. However, some may appear more ragged than others; letting their hair grow longer and unkempt, more wolfish if they take to their other side. It is rare for a human - or other humanoid species - to lose themselves completely to the wolf within. Culture Like normal wolves, werewolves are a pack animal. They do not like to be separated from their companions, and aren't meant to be alone. 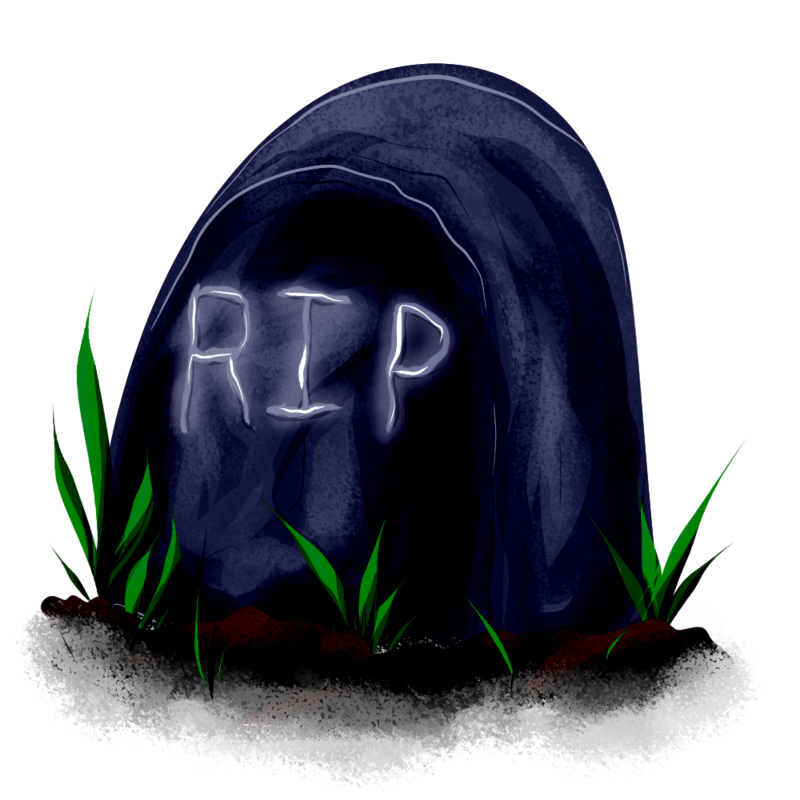 Other than this, most retain the personality traits of before their transformation. 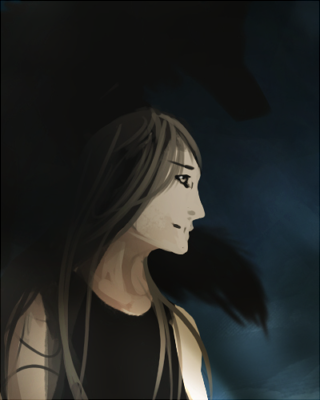 Abilities wolf form: In wolf form, a werewolf will retain the abilities he or she had as a human. If one was a fast runner, one would be faster than the average wolf in wolven form; if one was particularly strong, they'd be stronger in their animal form. Same with magic or control of reiatsu. However, these abilities are usually enhanced at least to some degree. Once a werewolf has been bitten and infected with the virus through saliva, their first transformation will either be instantly or dictated by the first full moon directly afterwards. After this first - and painful - transformation, they may revert to wolf form at will, gaining control as they get older. Strong emotion or pain may make them shift to one form or the other for the first year or so. human form: The werewolf human both gains a heighten in senses and a greater taste for meat. Humans sometimes have trouble dealing with the transformation, and some will lose their minds to it and become 'the wolf' in its entirety, much like the Faded shifters. Usually all humans, except for a select few, are also shunned away from their homes after a family member or friend learning of their being bitten. Many of these outcast wolves will wander and join with other werewolves, the biggest pack of these located in the Exodus Desert. With Death still posing an extreme threat to the First Realm, Leartes, L’zayn, Gaz’in, and Fenrir met in secret to discuss creating a new species, gifted with the power to shift between a humanoid and bestial form, to aid them in their fight against the dark god. L’zayn and Fenrir proposed a dragon, while Gaz’in suggested using the form of a big cat. Leartes supported using the wolf due to its ability to work together to bring down considerably larger and stronger foes. When the four failed to reach an agreement, Leartes left the other three, and withdrew into the forest. There, he found a strong human hunter, and blessed him with the ability to transform into the form of a wolf, and with greatly enhanced senses. Then Leartes shed two tears, and told the first werewolf to mix the tears in with his tribe’s drinks when they gathered to eat that evening. The tears caused the rest of the tribe to gain the same powers as the first of them, though they would never be so fast, or so strong. That night, when the moon rose, they shifted for the first time. Thus did the first werewolves come into being. Working together as a pack, they became fierce hunters, reclaiming the night from the beasts that would seek to hunt them. Name: N/A. Location: N/A. Status: Dead. This Ancient First was a man that could transform into a massive wolf with a silken red pelt. He was proud and loyal, distrustful of others but putting his pack first in all things, and was frightfully strong. Gifted with control over shadows, he was a terrible hunter of both predator and prey. Classification: anthropomorphic werewolf. Location: scattered. The worgen is a breed of werewolf that stands on two legs and have much more humanoid features than do normal werewolves, though their faces generally remain entirely lupine. Average height would be about 6 and a half to 7 feet tall, broad-shouldered and thick-furred, with shorter tails than their brethren. Many stay in these forms in well-hidden 'Tribes', instead of traditional packs. These Tribes are very ritualistic, and many a worgen will be seen sporting tattoos across their chests and shoulders, fur died a deep black. Female worgens are less inclined to join these tribes, however, and many will be seen on the streets of Albronel looking for mercenary work wearing elven- or dwarven-made armor. Classification: variable werewolf. Location: primarily cold, snowy regions; though can be found anywhere. A class of werewolf created via mutation when a werewolf and worgen breeds; these werewolves are called 'wargwolves' for the sounds they elicit from their victims. Gifted with three wolven forms instead of one, these creatures can transform into a regular, four-legged wolf known as the 'feral' form, a bipedal, worgen-like wolf known as the 'tall' form, an a bipedal, bestial form known as the 'war' form. Though specs for the other two forms may be found in both the werewolf and worgen species, the war-form is unique in that it echoes a demon's Tri'akun, only coming to light in instances of great need. They have much longer fangs and scythelike claws, are very heavily muscled, and much larger than both of their other forms. The average height for a war-wargwolf is ten feet tall, though some may grow larger, and some far shorter.